"Sisters don't need words. They have perfected a language of snarls and smiles and frowns and winks - expressions of shocked surprise and incredulity and disbelief. Sniffs and snorts and gasps and signs - that can undermine any tale you're telling." ~ Pam Brown. It may seem odd to write a year of columns about "firsts" as we welcome our second child into the family. Although life with a newborn is challenging, we've been here before. For the most part, we've encountered many of the "firsts" that come with raising children. Things like first time rolling over, first time eating cereal, first time saying mama. I still remember the first night Grace slept through the whole night, because neither of us could decide who had to go and check to make sure she was okay in the morning. This time around, we have a video monitor, so I think we're good to go when Charlotte decides she's no longer a party animal in the middle of the night. 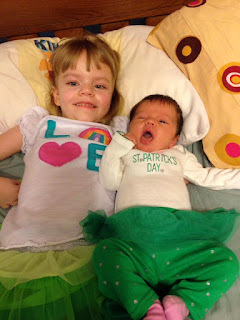 And so while many of those "firsts" are not necessarily our first time with babies, it is certainly a new experience for me raising sisters. Although I have three wonderful sisters-in-law and lots of friends, I never had a sister of my own. I am lucky to have a sweet younger brother, who has become one of my closest friends as an adult. But if anyone were to ask me when I was a child, I would never have thought Johnny and I would be close friends ever in life. We knew how to push each other's buttons and fought what seemed near constantly. But I don't think I would trade him for anything. Once Kyle and I got married, we knew we wanted to have more than one child. Both of us are so close to our siblings, and we wanted our children to have that experience too. It hasn't turned out exactly the way we planned, but I'm so glad that Grace and Charlotte will have each other. When we brought Charlotte home from the hospital, and laid her next to Grace on a blanket, sometimes Grace would smile and sometimes she would completely ignore Charlotte. It's hard to know exactly how much Grace comprehends about having a baby sister, but I like to think she's pretty proud of her. As they lay there next to each other, I began to wonder what Charlotte's future would hold. I think all parents do that with new babies. Would she be a good student? Would she want to play sports? Everyone keeps telling us what long fingers she has, and that she would be a good piano player. And then my heart skipped a beat. People told us that exact same thing when we brought Grace home. Kyle and I even talked about whether or not Grandma Kim would be able to give her piano lessons. Now, Grace couldn't even hold herself up on the piano bench, let alone reach the keys. I also struggled watching Charlotte kick her arms and legs (more like flailing them) around Grace. 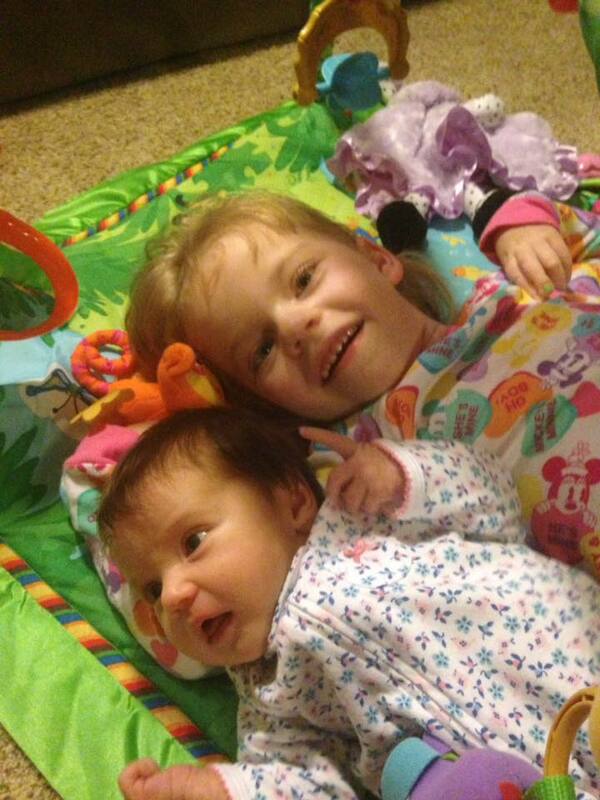 Would Grace wonder why her little sister could move around so much and she couldn't? My good sense tells me that Grace probably isn't able to think in terms like that, but I still worry sometimes if she wonders that it's not fair. It's hard at times when these thoughts take over my mind. I wonder how many years Grace and Charlotte will have together, and even if Charlotte will remember her time with Grace. But then I stop and do my best to refocus. This is what I do know. Charlotte is going to be a great friend to Grace. As she gets bigger, I know she will be the one to bring her toys, read her stories and best of all make her smile and laugh. 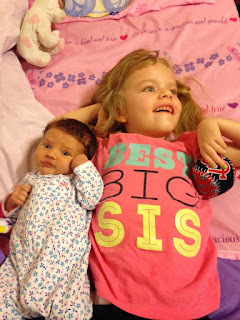 Grace has always loved being around kids, and I feel like Charlotte will be her best friend, even if they can't talk to one another. And I know this. 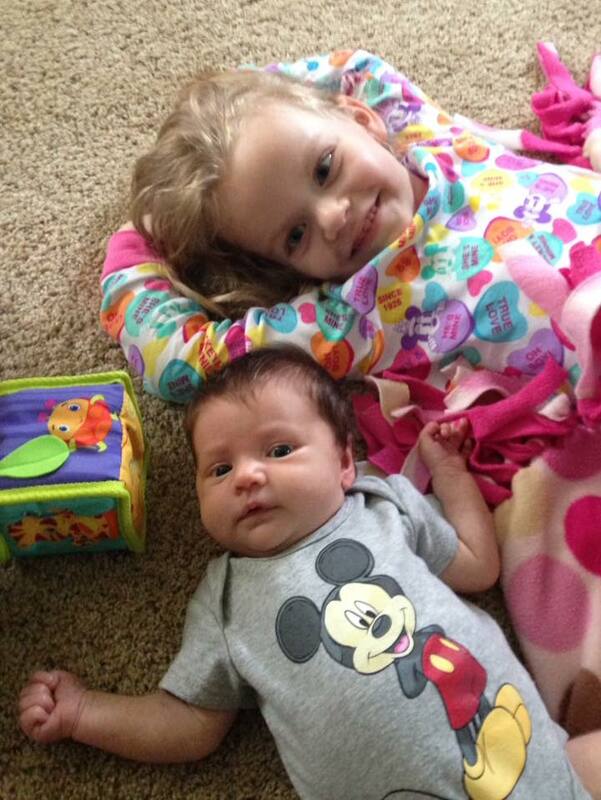 Grace will teach Charlotte more lessons in her lifetime than I have learned in mine. She will help Charlotte learn to be compassionate and kind to everyone, even those who are different. She will teach her patience when Charlotte has to wait if mommy and daddy are helping Grace. And she will teach her that love is the most powerful gift of all. I envision that Grace and Charlotte will have a language all their own and be able to communicate with one another without ever saying a single word. And that's the true bond of sisterhood. Internationally, Rare Disease Day is celebrated on Feb. 28, and last year, we worked hard at trying to raise awareness for INAD, but helping to bring attention to rare diseases in general. This year, we had a ten-day-old newborn, and weren't able to do as much, but raising awareness for this disease continues to be a top priority for us. We are so grateful to everyone who helps us meet that goal, by wearing gracelets or T-shirts, sharing our story or blog or asking us to speak about our journey. This year alone, we have had several opportunities, and we are always pleased to be asked. 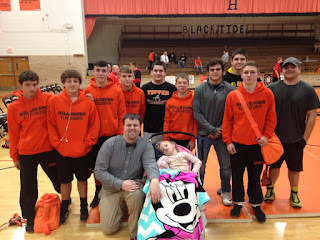 Our first chance this year came in January, when the Hillsboro High School wrestling team contacted Kyle and asked if we could bring Grace to their last home meet of the season because they had a donation to INAD research. Kyle covers the team as part of his duties at the paper, and really enjoys writing about wrestling. Kyle and Grace pose with members of the Topper wrestling team at their last home meet of the season. Just before Hillsboro's first match, the team came out and gave a $250 check to Kyle and Grace. After accepting the check, Kyle had a chance to tell the team thank you and share a bit of our story. While most of the Hillsboro fans have heard it a time or two, fans of the other two teams had not, and several even stopped by to talk to us on their way out. And every chance we share our story helps win the fight against INAD. Late last fall, Margie Eisenbarth asked if we would be willing to visit the Nokomis Women's Club in either November or February to share our story with members of her organization. 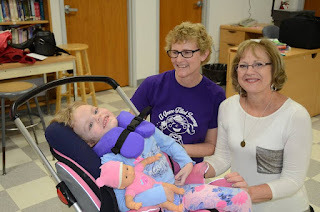 The Nokomis Women's Club had already donated twice to INAD research, so they knew a bit about our story, but we were thrilled to be able to visit in person and thank them for their generosity. Grace hung out with Grandma Susie while I spoke to the group. 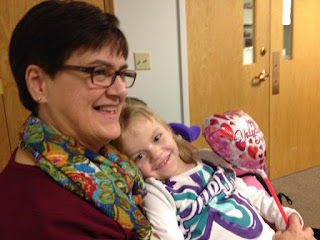 When the date of the meeting rolled around, Kyle ended up having to cover regional girls basketball, so mom rode with me and Grace to the meeting. I asked Margie exactly what she wanted me to talk about and for how long, and she said I could share about our fundraising efforts as well as a bit more about INAD for about 20 to 30 minutes. 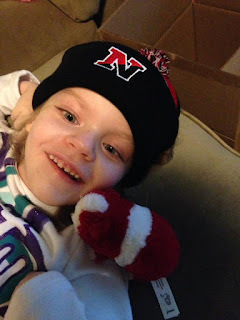 Grace got some goodies too, including a new Nokomis hat! That's a long time to talk, and I was nervous at first, but once I started talking, I think I talked their ears off. I started at the beginning and how we learned that Grace had INAD, and talked about how much money we had raised over the past two years. Their group had already made two donations of a couple hundred dollars each, and made another contribution for $250 after our presentation that night. One thing I shared is that although our communities have helped us to raise over $130,000, most of it has come in donations of all sizes, but that it all adds up fast. Through everyone's generosity, we will continue to search for a treatment or a cure. 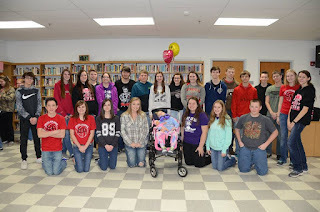 For the third year in a row, our family was invited back to Morrisonville High School to talk to biology students about genetics. It started right after Grace was diagnosed with INAD and teacher Janet Walch asked Kyle if she could show her students a photo of Grace. He offered instead to bring Grace to meet the students, where she was immediately adopted by the student body. Hanging out with Morrisonville students. Grace definitely loved all the attention! So happy to be part of the Mohawk family! Grace had big smiles for some of her favorite Morrisonville teachers! 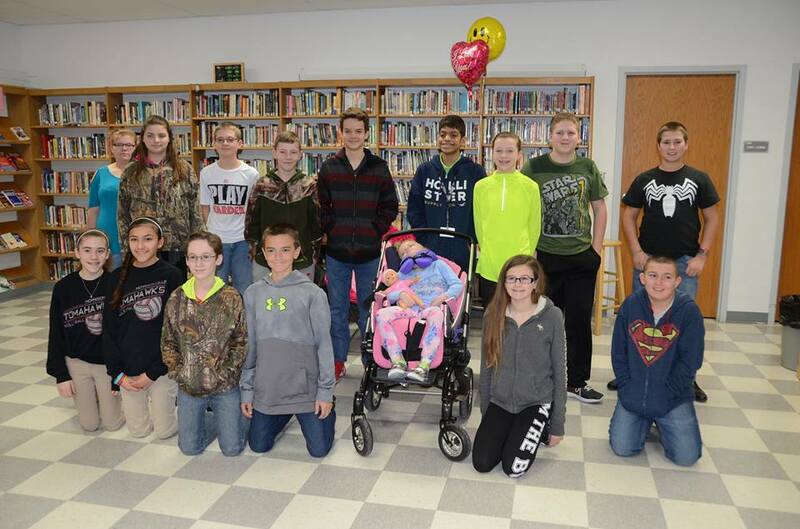 To date, Morrisonville has raised more than $5,000 for research through penny wars, baseball games, bake sales and more. We always love to go back and talk to the students about the genetics behind INAD. This year, they had been studying in vitro fertilization, and had questions about our journey. The kids always ask good questions, and they love to see Grace. I love to watch them come up and talk to her before and after the program. She just lights up when the kids come to talk to her. 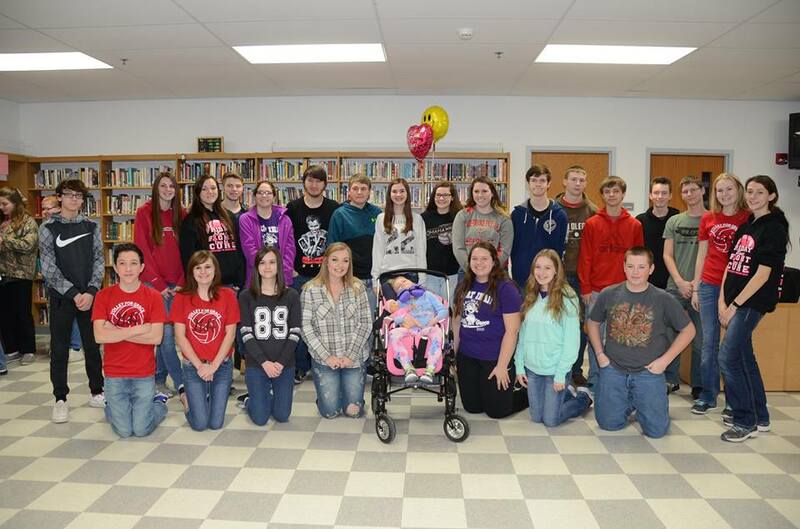 And we feel so blessed they have adopted her into the Mohawk family. Another longtime part of team Grace is the Lincolnwood junior and senior high volleyball teams, who were some of the first to start doing fundraisers for INAD research. At the time, Kyle's cousins, Kayley and Kensey were part of the junior high team, who started doing "Serving for Grace" fundraisers in between games. That first season, we made it to a couple of games and Kyle even had a chance to show off his serving prowess. Kyle and Grace got to be in the team photo after the Lady Knights won sectionals. 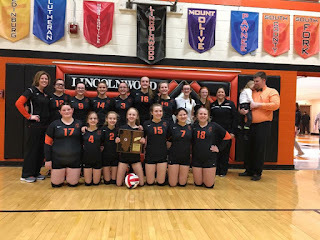 Just this week, Kyle and I took both girls to see the eighth grade Knights win their second consecutive sectional championship. Grace was all smiles to see the kids, and they gave us a $200 check from this year's "Serving for Grace" fundraisers throughout the season. We wish them the very best of luck at state this weekend! 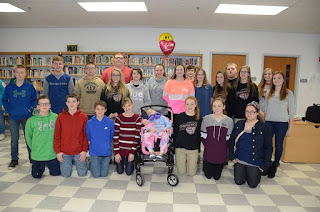 Over the past two years, both the junior and senior high teams have continued their "Serving for Grace" fundraisers, and the high school team has even added Volley for Grace awareness nights with several other local schools. In fact, this fall, they will join forces with the Hillsboro team to host an 18-team tournament, called "A Grace Filled Tourney," and we can't wait to be a part of it! There are still plenty of chances this year to join Team Grace and help us raise awareness for INAD. Currently, members of the Litchfield High School Student Council are selling temporary license plates in the state of Illinois for $30, sporting Princess Grace. 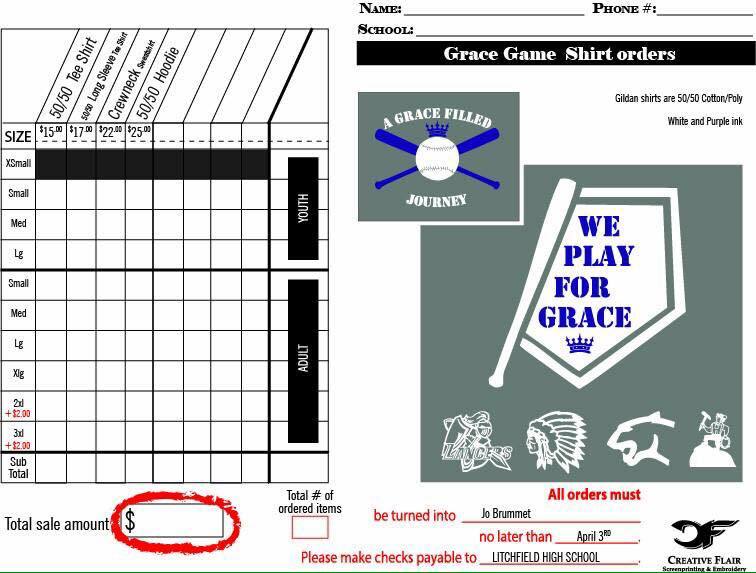 They are also selling baseball shirts for this year's Montgomery County Baseball Tournament on April 15 at Nokomis High School. 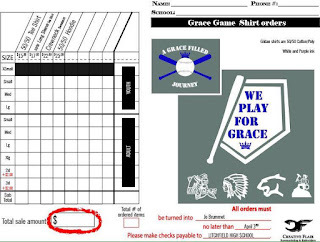 Check out the newest Grace shirts, now available at Litchfield High School! This is the second year they have done the license plate fundraiser, and we love driving around with Grace on our license plates. Thanks to all the kids for helping out! The following weekend, Kyle and his beautiful girls will be attending the father-daughter dance at Lincolnwood High School, which raises money for a scholarship in Grace's name for Lincolnwood seniors and alumni. It will be so much fun to see all the little girls dressed up and dancing with their dads, and I know Kyle will look forward to dancing with Grace and Charlotte. And don't forget to mark your calendars for this year's Grace Cup senior soccer all-star game on June 3 in Raymond and the second "A Grace-Filled Journey 5K" on September 2 in Hillsboro. Both in-person and virtual participation will be included in the 5K race. For more information about any of these events, follow us on Facebook at "A Grace-Filled Journey" or on Twitter at glhjourney.